Hey everyone! I cannot believe that Isabelle has just turned 6 months of age. I am not going to lie I definitely got a little emotional yesterday. 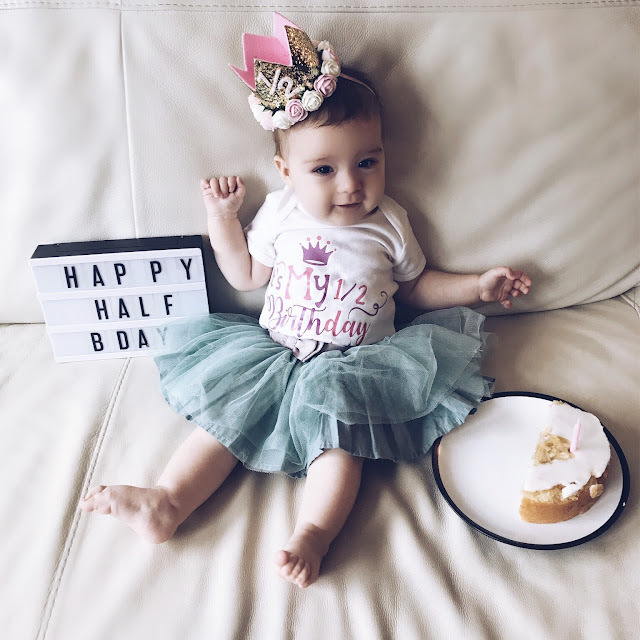 She is already half way through her first year and it so true what they say - time flies!! It seems to have been forever since I did a baby post and since her current age is so fun I thought it was a good time to do an update. My mindset at the moment is that we have managed to keep this creature alive for 6 months so confidence at being a parent has increased helping my husband and I to be a bit more relaxed. One of the greatest things that has come out of her getting older is her reflux has stopped! Isabelle suffered dreadfully with reflux and there were times when I left like crying after an hour long breast feeding session ended up on the floor! Even though I had been to the doctor, there really wasn't a huge amount that could be done only to wait for her to grow out of the reflux. Thankfully a few weeks ago I noticed a huge difference. No more reflux is such a relief! For any mothers out there that have experienced the same..you know what I am talking about! Isabelle also has a tooth coming up which has broken through but thankfully she hasn't been too fussy with this happening. I was struck down with a very bad cold last week and unfortunately it passed to her. After 6 month without a sniffle it was very hard seeing her unwell with a nasty cough. It is always a bit daunting wondering whether you need to see a doctor or whether it is okay to just ride it out..particularly in the middle of the night when baby is completely miserable and out of sorts! We are both thankfully over the worst of it now and it is nice to have her first illness out of the way. Her motor skills are improving by the day. In particular her ability to pass objects between her hands and maintain a grip of objects is improving. We are still trying to do tummy time daily (although it certainly doesn't always happen!). Everything she grabs at the moment is going in her mouth. Another milestone is her starting on solids. It is a slow process but as soon as her high chair arrives this week I can try some 'Baby Lead Weaning'. For now I am giving her soft foods like scrambled egg, avocado and banana. I really like the concept of giving babies food that you eat yourself and allowing them to attempt to feed themselves. I terms of parenting strategies I love the concept of French or Mediterranean parenting. On a recent trip to Spain I was just in awe of the Spanish kids that were sitting happily with their parents at dinner not causing any trouble. I recently read the book 'Bebe day by day' which was written by an American woman living in France. She explores the concept of French parenting and I love the overarching theme; a baby fits into your life and not the other way around. Isabelle has always been good at sleeping through the night since she was a newborn. However, it is only now that we have managed to start getting her into more of a routine (the reflux made routine napping really difficult!). She naps three time during the day and we put her to bed at around 8pm. I will do a post on how we get her to sleep through the night. Isabelle is still exclusively breastfed and I haven't really decided if I want to continue exclusively yet. I'm just going to take it one day at a time but the overwhelming pressure I put on myself to breastfeed for the first 6 months has thankfully lifted. She is nearly sitting up by herself but not with out assistance yer. She is blowing raspberries and making all sorts of wonderful sounds. She is long and skinny and is now wearing 6-9 months clothes and size 2 pampers nappies. She has the tiniest feet and is still wearing newborn shoes. Her dark locks are definitely brightening up but she hasn't lost her hair at all. All in all it has been a tough but extremely rewarding 6 months. At the moment Isabelle seems to be doing something new everyday which is exciting to watch. I am looking forward to the next 6 months and beyond!